Ramadan is the ninth month of the Islamic calendar, and is observed by Muslims worldwide as a month of fasting to commemorate the first revelation of the Quran to Muhammad according to Islamic belief. A crescent moon can be seen over palm trees at sunset in Manama, Bahrain, marking the beginning of the Muslim month of Ramadan. 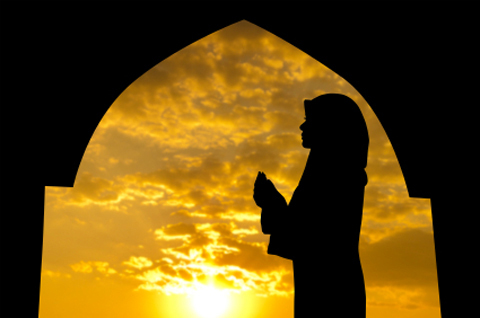 During Ramadan, observers are expected to abstain from food, drink, and other pleasures from dawn to dusk. Leaving these activities out from the daily routine is intended to help the mind concentrate on prayer, spirituality, charity, and to purify the body and mind. Muslims are also expected to not indulge in negative activities such as gossiping and cursing. Some reports have also claimed that crime rates decrease during Ramadan, with a heavy decrease in the number of murders. Fasting during Ramadan is believed to have been decided keeping in mind all kinds of social, physical as well as political factors. One isn’t forced to fast. Pregnant women, people who are mentally or physically ill, and sometimes women who are breastfeeding are specially excused from fasting because of their health constraints and nutritional requirements. Even children aren’t obliged to fast till the time they hit puberty. In countries where Muslims are the majority, Ramadan has a drastic impact on daily life. Egypt pushes the clocks back an hour during the holy month so that the fast feels like it is ending earlier and the evenings are lengthened. Work days are made shorter during the month to accommodate the additional time spent in prayer and in enjoying festive meals to end the daily fast. If bankers and economists in Muslim countries are to be believed, Ramadan almost always ushers in a month-long period of inflation as people drastically increase the amount of money spent on clothing and food. The prices of certain staples go up dramatically – according to a former Monitor correspondent in Cairo, during Ramadan a cup of tea can cost six times its normal price. However, economic productivity also declines because of the shorter working hours and the general weakness among those abstaining from food and water all day. In this highly profit driven world, no activity can be unlinked from the concept of money making. Like all celebrations and holidays, Ramadan has become largely commercialized around the world with waste and excess expenditures. Advertisements skyrocket during the month, lavish buffets are offered and well spent on, and hotels in Mecca charge extraordinarily high prices to the pilgrims that fly to the holy city. City dumps and hospitals are stretched to capacity because of the surge in food waste and gluttony. At the end of Ramadan comes Eid ul Fitr, the celebration of which begins as soon as the new moon is sighted in the sky. Eid is an important festival for the Muslims. Amidst attending processions and exchanging gifts, Muslims must also contribute to a charity so that the poor may also celebrate the breaking of the fast. Eid ul Fitr is also considered a time of reverence. Muslims praise Allah for helping them get through the month and ask for forgiveness for the sins they’ve committed.